The Xiaomi Mi A2 is powered by the Google's Android One which means the device is running close to stock Android and it's expected to receive early updates compared to other MIUI powered devices. 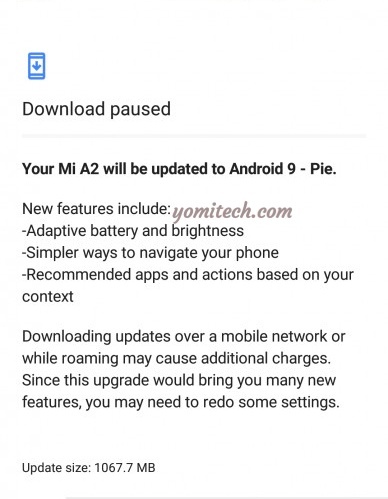 After just a few days of beta testing, Xiaomi has officially started rolling out the stable Android 9.0 pie update for the Mi A2. The updated which is 1.06GB in size comes with features like Adaptive battery and brightness, new navigation gesture, some improvements as well as other standard Android Pie features. The update also includes the latest November security patch. 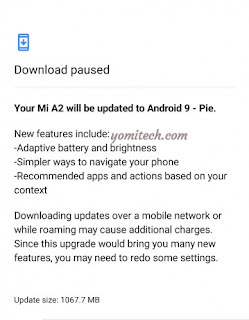 The Android Pie update for Xiaomi Mi A2 is being rolled out in batches with India being the first to receive the update. Once you receive the OTA notification, make sure your phone is connected to a stable WiFi network and it's charged before you proceed.